The Holy Bible is the word of God and the book of life. It is areligious book, and an inspirational and uplifting work. It is alsoa historical document. I bring you this volume of a series of BibleQuizzes to share with you some of the most beautiful messages andlessons in the Holy Book. It is not about how many correct answersyou come up with. It is more about getting you to reflect on themessage of peace and love that Jesus gave us. There will be severalmore volumes, each with ten questions, and the correct answers willbe provided at the end of each series. Reflect, contemplate,meditate, pray, and let the message be part of your life. Biblicalera were difficult times, and we presently live in a tumultuousperiod. But the message is the same. We must not despair. Allproblems can be solved through dialogue, prayers, and peaceful,nonviolent action. Those who are persecuted and aggrieved have aright to protest, but more can be achieved through peacefuldemonstration than through revenge and violence. Silence cansometimes be louder than 100 decibels. We are all children of God,and must learn the virtues of tolerance and forgiveness. As thefamous hymn goes “Let there be peace on earth and let it begin withme.” We should all open our hearts to be instruments of God’speace. In the words of Saint Francis of Assisi, “Lord, make me aninstrument of Your peace. Where there is hatred, let me sow love;where there is injury, pardon; where there is doubt, faith; wherethere is despair, hope; where there is darkness, light; where thereis sadness, joy. O, Divine Master, grant that I may not so muchseek to be consoled as to console; to be understood as tounderstand; to be loved as to love; For it is in giving that wereceive; it is in pardoning that we are pardoned; it is in dyingthat we are born again to eternal life.”The greatest king who everreigned conquered the world without raising a sword, or commandingan army. His mission on earth was to protect the poor, the sick,the victims of violence, and those who may have been unfairlytreated, and incarcerated.“The Spirit of the Lord GOD is upon me,because the LORD has anointed me to bring good news to the poor; hehas sent me to bind up the brokenhearted, to proclaim liberty tothe captives, and the opening of the prison to those who arebound…..”Spread the Gospel. God bless you.I THANK GOD FOREVERYTHING. English Audio Bible The Bible (from Koine Greek τὰ βιβλία, tàbiblía, "the books") is a collection of texts sacred in Judaism andChristianity. It is a collection of scriptures written at differenttimes by different authors in different locations. Jews andChristians consider the books of the Bible to be a product ofdivine inspiration or an authoritative record of the relationshipbetween God and humans. The Christian Old Testament overlaps withthe Hebrew Bible and the Greek Septuagint; the Hebrew Bible isknown in Judaism as the Tanakh. The New Testament is a collectionof writings by early Christians, believed to be mostly Jewishdisciples of Christ, written in first-century Koine Greek. Theseearly Christian Greek writings consist of narratives, letters, andapocalyptic writings. Among Christian denominations there is somedisagreement about the contents of the canon, primarily in theApocrypha, a list of works that are regarded with varying levels ofrespect. Attitudes towards the Bible also vary amongst Christiangroups. Roman Catholics, Anglicans and Eastern Orthodox Christiansstress the harmony and importance of the Bible and sacredtradition, while Protestant churches focus on the idea of solascriptura, or scripture alone. This concept arose during theProtestant Reformation, and many denominations today continue tosupport the use of the Bible as the only source of Christianteaching. With estimated total sales of over 5 billion copies, theBible is widely considered to be the best-selling book of all time.It has estimated annual sales of 100 million copies, and has been amajor influence on literature and history, especially in the Westwhere the Gutenberg Bible was the first mass-printed book. It wasthe first book ever printed using movable type. Welcome to Children's Bible, with this free application adapted tothe world of children you can enjoy home from home a lot of historyand passages of the Bible, the Old Testament of the New Testament,genesis ....... For your children feel the word of God our LordJesus closer to his heart Mom and Dad, Children's Bible is a freeideal for your children to learn the culture and the most importantvalues of our holy Catholic, Christian and Roman religion thatJesus, God and our venerable Lord infuse us in the beginning timeof application. It is a good day to start enjoying life pleasantlyof our Lord, Jesus Christ. Children's Bible you will find a lot ofpictures, videos and Christian songs, children's music, Christianmusic to sing the word of God, enjoying your friends famia and themost beautiful of our Catholic religion. We believe that theCatholic Bible (Holy Bible renia Valera 1960 Bible God speakstoday) should be close to everyone, so this application is based onit free. So do not waste anymore time Download this application foryour mobile (cell) or Tablet and you will not regret, enjoy fromhome the wonderful world of the Christian religion, with storieslike: Cain and Abel. The history of San Jose. The Garden of Eden,Adam and Eve. The story of Moses. Noah's Ark. The Holy Bible. Thebaptism of Jesus. The miracles of Jesus. Christ loves you. RememberChildren Bible is totally free of charge and you can download it onyour mobile (cell) or tablet and share by Whasapp and Facebook andother social networks with your friends, family, coworkers, etc. Have you read all the books of the Bible? 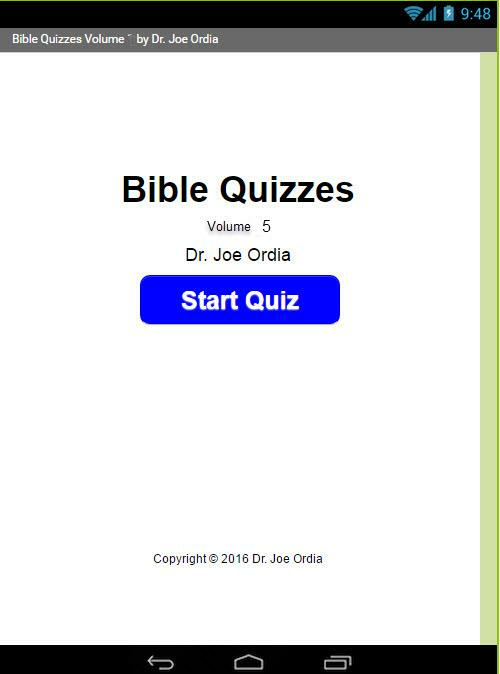 Start the Bible TriviaQuiz Game With Bible Quiz Questions and check your knowledge! Howwell do you know all the biblical characters, Old and Newtestament, biblical quotes and prayers? If you like fun quizzes onworld general knowledge and religions, this is a perfect past timeapp for you! A variety of Bible trivia questions - guess the quote,name Christian saints, answer questions about psalms and proverbs,hymns and so much more. What are the ten commandments of God? Howmany books of Moses are there? Who were Samson and Delilah? What isthe story of Noah and the Ark? Download Bible quiz questions andanswers for kids and adults and test your knowledge right now! Findout how much you really remember all the biblical stories and testyour memory with this fascinating mind game. Among a variety offree Bible games and quiz for adults and children choose the bestone for your family! 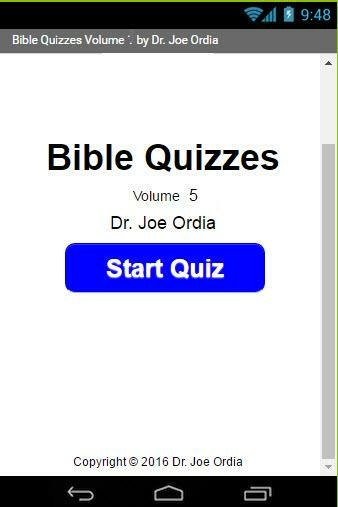 “Bible Trivia Quiz Game With Bible QuizQuestions” features: 🌟 Two game modes available: * Endless - playfor hours as long as you give correct answers to various biblicalquiz questions. The game ends as soon as you give 3 wrong answers. * Time - prolong your playing time as long as you give correctanswers! Each correct answer means additional time and each wronganswers reduces your playing time. 🌟 Four different types ofquestions: * Multiple Choice - choose the correct out of fouroffered answers; * Entry - arrange a word from letters to give theanswer; * Scratch - scratch the surface of a picture and type inthe correct answer; * Blur - a blurred picture of an object isshown and your task is to sharpen the blurred image and type in thecorrect answer. Play fun Bible quiz free in English offline withmany questions on both Old and New Testament! Understanding theBible scriptures is essential for every religious person. For some,this is the impossible quiz challenge! The most interestingChristian quiz on The Holy Bible Old and New testaments King Jamesversion is now at the palm of your hand! Interesting andintelligent questions and answers will help you learn all theimportant facts about Christianity. Gain knowledge on the largestof religions of the world with new Bible quiz - religious game foreveryone. Smart quizzes are an excellent way to improve yourgeneral knowledge and IQ - get some real brain training and educateyourself! You don't even have to be online to play - download theintelligent Bible quiz questions app and then play without internetany time you want! Get this smart Bible app for free to check howmuch you really remember your church reading. The most useful Biblequiz with answers for youth to learn about Christian beliefs andvalues. This Bible trivia questions and answers has some easy butalso many hard questions. Can you answer them all? How to study theBible the best possible way? You can play this GK quiz 2017 offlineas well! Biblical games for kids and adults are the best way tolearn about Christianity today, Jesus Christ and his learning. Youwon't need any Bible study tools or concordance once you pass thisamusing Biblical test. If you like playing religious games, youwill love this new quiz app on Christian religion! Download forfree the best Bible trivia quiz apps with interesting questions andanswers. Check how much you really know! Download Bible Trivia QuizGame With Bible Quiz Questions and test your knowledge on Christianreligion holy book right now! The Holy Bible Reina Valera 1960 is the book inspired by God andwritten by the men that he chose to comply with his purpose, in itwe can see God’s temperament, his great love, his mercy, the planthat God proposed through his Son Jesus Christ and the revelationsof the future for humanity. The application is easy to use and itallows you to read the Holy Scriptures in a fast and comfortableway, ideal to take notes of the preaching, marking a verse fast andsaving your favorite verses. Afterwards we will mention thefeatures of the application: • To see the menu option scroll thescreen from left to right, you can also click on the icon locatedon the upper bar or you can also click on the instruction messagethat appears at the start. • To go back to the previously seen menuyou can press the button behind your telephone. • Daily on thestart menu you can see a verse to memorize. • The Bible is dividedin Old Testament and New Testament, you can select the book youwish and start reading the chapters of the Bible, next to each bookyou will find the corresponding number of the chapters. • You canscroll the screen to change the chapter or you can click on theleft and right arrows, or you can also go directly to a chapter bysearching for it on the list and clicking on the chapter icon inthe center. • You can choose one or several verses of a chapter andsend it to a bookmark, or copy the verse or create a new favoriteor add it to a previous one, or create a preaching or add it toanother one or share the verse with a friend. • The BookClasification menu will allow you to see the books according to itsclasification and you can go to the book and read the chapters youwish. • The bookmark will show you the verses you have marked inorder for you to have a faster access to it or for you to see itlater. • The Favorite menu will allow you to see and edit thenotes, to share your group of favorites and delete the group or averse. • The Preacher menu will allow you to see and edit thepreacher and its title, share the group, edit a note per verse orerase it and delete the group or a verse. • The search menu willallow you to put a word in the text and search the whole Bible, inthe old or new Testament, even the book. If you specify the rangeof your search, you can take less time in finding coincidences, butif you select the whole Bible, you will take less time in findingcoincidences and you can’t cancel until the search is over, but itwill bring all the results possible in all the Bible regarding theword you put before, likewise it will show you a list of books thatyou can click, in the verse of your preference and you can see itscontext. • The menu shows a list of situations that a group ofverse reveal, so you can have some biblical basis on some of thetopics. • The configuration will allow you to change the size ofthe letters and the Reading mode (nocturnal and diurnal), activateand deactivate daily notifications, and if you want you canre-establish daily the values by default. • It allows you to seethe application version, go to Google Play to comment, rate theapplication or simply share the Bible with a friend. • You canclose the application when you want. • The Application Holy BibleReina Valera 1960 is considered an efficient tool for the studiesof God’s words, the intellectual author is God. • The applicationis for free and keeps its development through ads. • When you sharea verse with a friend, you’re aware that at the beginning the nameof the app will show and that at the end of each text, an app linkwill also show the link of the application to Google Play as well,to promote the use of it. • We hope this is useful and that youreceive many blessings from God.